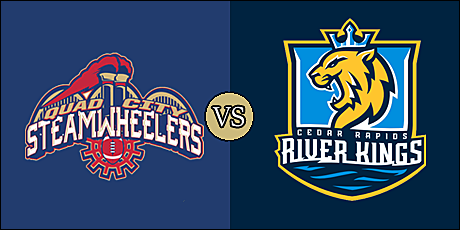 What: The Steamwheelers are on the road for the first time this season as they face the River Kings. When: Friday, March 15 at 5:05 p.m. pacific (7:05 p.m. central). Where: U.S. Cellular Center; Cedar Rapids, Iowa. 2019 Head to Head: May 17 - River Kings at Steamwheelers. Note: These teams are separated by about an hour and a half drive. The Steamwheelers are 1-1 overall and 0-0 on the road. They are coming off a 53-39 home loss to the Iowa Barnstormers on March 3. The River Kings are 1-2 overall and 1-1 at home. They are coming off a 65-48 home win over the San Diego Strike Force on March 9. River Kings DB Tavion Garrison. With the Steamwheelers embarking on their first IFL season and the River Kings being newly rebranded, this game could be the birth of a new, regional rivalry. Quad City comes in at 1-1. 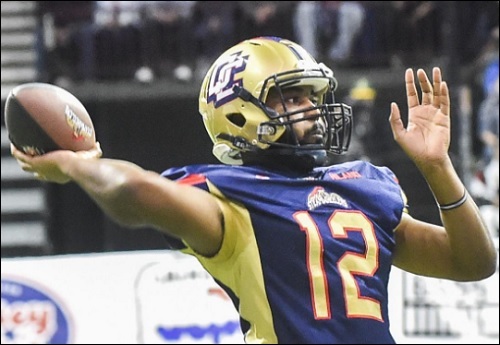 They opened up with an impressive opening night win over the San Diego Strike Force, but fell to the defensing champion Iowa Barnstormers two weeks ago. They are coming off a bye as they attempt to get back into the win column in this one. The River Kings have looked good at home thus far this season and, if not for a last second field goal by the Sioux Falls Storm's Miles Bergner in the season opener, they could enter this game with a plus-.500 record. 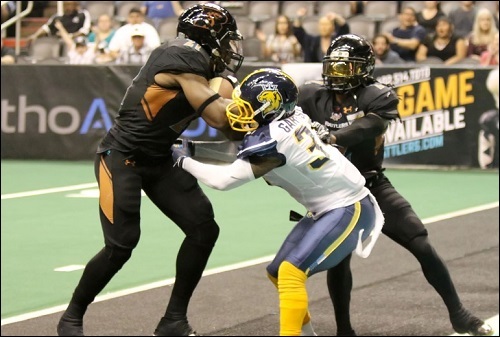 after being blown out by the Arizona Rattlers in week 2, they responded with a home win over the Strike Force last week. The Steamwheelers and the River Kings have one common opponent so far in the season. Quad City defeated the Strike Force, 67-49, in week 1. The River Kings turned back the Strike Force, 65-48, in week 3. 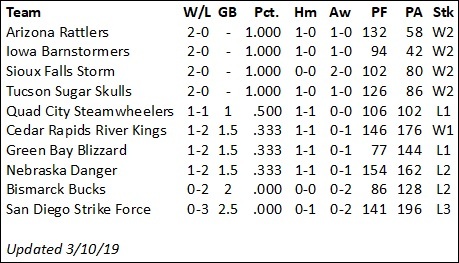 Note that the Steamwheelers have played two games, while the River Kings have played three. This is the first of two meetings between the teams this season. E.J. Hilliard is averaging 193.5 passing yards per game, which is good for second in the IFL. He is completing 62.2 percent of his passes and has thrown six touchdown passes and has yet to throw an interception. Hilliard has rushed 16 times for 57 yards and a team-high three touchdowns. Carlos Wiggins is the team's leading rusher, gaining 62 yards off nine carries (6.9 yards per carry) with a touchdown. Isiah Neely has rushed for a pair of touchdowns, as has wide receiver Darius Hicks. Neely is second on the team in receptions with eight, for 65 yards and two touchdowns. Keyvan Rudd leads the receiving group with nine catches for 154 yards and two touchdowns His 77 yards per game are third in the league.. Quinton Pedroza has seven receptions for 120 yards and a score. Defensive back Denzel McDaniel leads the defense with 18 total tackles. Fellow DB's Everett Nicholas V and Keith Lewis have two and one interceptions, respectively. Defensive lineman Kewan Alfred has a sack and a fumble recovery, and DL Perez Ford has a sack to his credit. Jacob Stytz has hit 12 of 14 of his point after attempts. He also has converted on a field goal of 41 yards. The River Kings looked good in their 17-point win over the Strike Force. Kurt Palandech is second in the IFL with 10 passing touchdowns, and fourth with 145.7 passing yards per game. He comes in completing 67.7 percent of his passes. and only a single interception through three games. Palandech is also averaging 45.3 rushing yards per game and has hit the end zone twice. Nathaniel Chavious is third in the league with 61.0 rushing yards per game, and is tied for third with six rushing touchdowns. Wide receiver Marquel Wade is one of the most reliable receivers in the game. He comes in with 18 catches for 187 yards and five touchdowns. Jordan Smith is a talented compliment to Wade and comes in with nine receptions for 103 yards and three touchdowns. Linebacker Malik Slater and DB Tavion Garrison lead Cedar Rapids with 17 total tackles, with the former recording the team's lone sack this season. DB Travonti "Tuff" Johnson has 14 total tackles and a fumble recovery, while his cousin, DB Ricky Johnson has an interception and five pass break ups. Henry Nell is 17 of 18 on point after tries, and five of 10 on his field goal attempts with an IFL season long of 50 yards. March 15 - Quad City Steamwheelers at Cedar Rapids River Kings, 5:05 p.m.
March 16 - Sioux Falls Storm at Bismarck Bucks, 4:05 p.m.
March 16 - Tucson Sugar Skulls at Arizona Rattlers, 5:05 p.m. I think this is going to be a really competitive game. I'm looking forward to it! Steamwheelers kick off. River Kings have the ball first. FG Cedar Rapids. Henry Nell 23 yards. 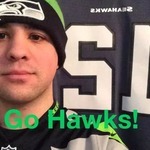 Eric Banford mention, after I posted his Player Q&A earlier today! Awesomesauce! I love the Q&A's! Touchdown Steamwheelers. Quinton Pedroza 4 yard run. Kenneth Rowe kick. Big return for Chavious., but hurt by the holding penalty. Touchdown Cedar Rapids. Marquel Wade 43 yard pass from Kurt Palendech. Henry Nell kick. FG Steamwheelers. Kenneth Rowe 26 yards. FG Cedar Rapids. Henry Nell 18 yards. Looks like we have a close one. Kind of low scoring too. Not sure how long I'll be watching the game but. Here I be.